Prime Minister David Cameron’s intentions to overhaul British Apprenticeships has been hailed as ‘another great step forward’ by QinetiQ CEO and co-founder of The 5% Club, Leo Quinn. Cameron spoke to 600 apprentices at the Mini Plant in Oxford on Monday, and revealed his plans introduce year-long apprenticeships that will be graded on a three-point scale to put them on par with qualifications. Introducing the new initiative, the Prime Minister said: “What we’re announcing is going to make a massive difference to thousands of young people’s lives. It involves 2 things. “One: we’re saying; if you want an apprenticeship, we’re going to make sure you do the best apprenticeship in the world. The reforms we’re announcing today will put employers in the driving seat and ensure that we deliver high quality training that supports you and our economy for years to come. “Two: we’re saying if you need help preparing for an apprenticeship or want to get straight into the world of work, we’ll help you to”. Leo Quinn welcomed the overhaul and called on British industry to step up their efforts: “We as employers need to recognize that better apprentice and graduate programmes, and the investment in skills they represent, are critical to our ability to compete effectively for the exports that will drive our economic growth. “By creating new opportunities for tomorrow’s generation, British industry can help Government schemes such as Trailblazer Pilots to make a lifelong difference to the career prospects of the next generation and their ability to share in our national prosperity. Prime Minister David Cameron announced plans yesterday to overhaul vocational schemes in the UK. 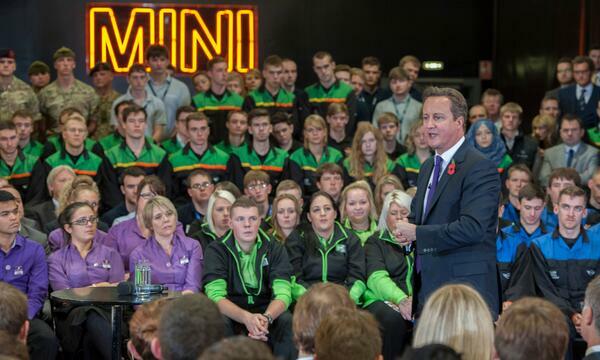 Speaking at the Mini factory in Oxford, Cameron spoke of his intention to introduce year-long apprenticeships that will be graded on a three-point scale to put them on par with qualifications. Speaking to 600 apprentices yesterday, Cameron said: “I said earlier this month that I want us to deal with the scourge of youth unemployment by giving young people more chances and choices in life. This goes to the heart of my vision for this country: backing hard working people who want to get on in life and making sure Britain competes and thrives in the global race. “So I am really excited to be here today. What we’re announcing is going to make a massive difference to thousands of young people’s lives. It involves 2 things. “One: we’re saying; if you want an apprenticeship, we’re going to make sure you do the best apprenticeship in the world. The reforms we’re announcing today will put employers in the driving seat and ensure that we deliver high quality training that supports you and our economy for years to come. And as the range of companies signed up today shows, these are apprenticeships in different industries and sectors meaning people have a real choice about the career they want and our economy is balanced. Backing the new vocational training scheme are 60 companies, collectively known as Trailblazers. The firms pledging their support include Marks & Spencer, Tesco, National Grid, Barclays, BAE Systems and BT. In total, 100,00 training places will be offered over the next two years. Jonathan Lawson, CEO of Vision Express, said: “The UK is suffering from a dearth of skills, while at the same time experience high levels of youth unemployment. The government announcements on Apprenticeships are welcome, but the fact is business leaders need to come together on this issue in order to tackle the problem head on. What do you make of the government’s plans to overhaul the UK’s apprenticeship and training schemes?